These classes will follow a fun, progressive curriculum guiding the students to an introduction of the four Olympic events and trampoline. An increase in body strength, coordination, balance and agility will be achieved. Advanced Level 1 Recreation is a 75 minute class designed for the beginner gymnast who shows athletic promise and dedicated attention span. These classes are 1.5 hours and are designed for returning gymnasts or those with prior experience. The program continues to teach progressive skills while preparing the gymnasts for more advanced or team levels. Participation on team is through invitation only. Cobra has seven levels of team, ranging from beginner to advanced. Make this summer THE summer that your child achieves their tumbling skills! Cobra is offering an eight week intensive for girls ages 6-16 of any level of experience. We have two coaches and are excited to offer two different levels of groupings for the summer. The class will utilize our trampoline, tumble track, air track and other brand new training mats to accomplish great new skills and be ready for team tryouts of any style: acro, cheer or gymnastics! 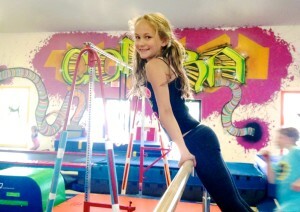 These classes provide a fresh approach to gymnastics training at Cobra. Using our trampolines, bars, hills, mats, rope, beams and a variety of props, we will create challenges and obstacle courses that will allow your child to develop strength, body awareness and agility.